Comic Odyssey: ACTION COMICS #1 SELLS FOR A WHOPPING $1 MILLION DOLLARS!!! ACTION COMICS #1 SELLS FOR A WHOPPING $1 MILLION DOLLARS!!! A CGC graded 8.0 copy of Action Comics #1 was sold for a record $1 MILLION DOLLARS on Monday, February 22, 2010. 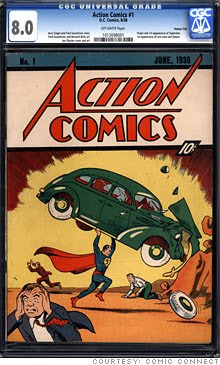 As most of you know, Action Comics #1 features the 1st appearance of Superman in 1938. The comic was sold by Comic Connect based in New York to an unknown collector. There are only about 100 copies of Action Comics #1 known to exist but only 2 copies are known to be in this high of a grade.